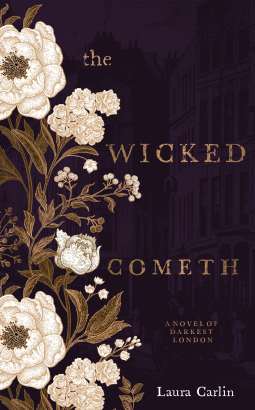 The Wicked Cometh is Laura Carlin’s debut novel. The title of this book comes from Proverbs XVIII, 3: When the wicked cometh, then cometh also contempt, and with ignominy reproach. The opening chapter sets the scene as The Morning Herald reports on the growing numbers of missing people in London in September 1831. So, you know straight away that this is a tale of wickedness and evil. It begins well, setting the scene with detailed descriptive writing full of vivid imagery, evoking the sights, smells, and sounds of life in the darkest and foulest corners of London in the 1830s. It’s narrated in the present tense by Hester White, a young woman of eighteen. She grew up in a parsonage in Lincolnshire but she was orphaned at the age of 12 and went to live in London with Jacob, formerly her father’s gardener, and his wife Meg in a slum dwelling, just one room with a brick and dirt floor. I liked Hester, who originally came from a reasonably well-off family and was educated. She lives in hope of leaving London and escaping from her miserable life. A way out presents itself when she is knocked down and injured by Dr Calder Brock’s carriage and whisked away to stay at his family’s country house, Waterford Hall near Stratford. Calder intends to use her as an experiment, to build up her physical health, and to give her the chance of improving her life he persuades his sister Rebekah to educate her. He wishes to prove that even those from the gutter can be educated and Hester exaggerates her ignorance in order to escape being sent to the London Society for the Suppression of Mendicity, a place of shame feared by the poor. Known as the ‘Dicity’ it was one step on the downward path either to transportation in the hulks or to the poorhouse. So far, so good but the first part of the book moves very slowly and my attention began to wander as I thought the wicked were a long time in coming. But come they did in abundance in the latter part of the book and as the relationship between Hester and Rebekah develops they begin to uncover the sinister secrets of what is behind the mystery of the missing people. And it is a dark, gruesome and grim secret. Overall, I’m rather torn about this book – parts of it I really enjoyed, even though it’s written in the present tense, which I don’t like. The characters are well-drawn and the settings are superb, but the slow pace failed to provide enough tension especially in the middle section. The suspense and drama increased rapidly towards the end, but the final twist seemed contrived and not very convincing. But I can see from Goodreads that other readers enjoyed this book far more than I did. My thanks to the publishers for a review copy via NetGalley. What a pity! I’ve had my eye in this one because I love the cover so much, but the present tense and slow pace means I’d probably feel the same about it as you did. Oh, well! Yes, the cover is lovely and I wanted to like it, but … it meanders too much and with too much melodrama, plus the present tense, meant it didn’t live up to my expectations. Excellent review as ever, Margaret. I have to say, though, that this probably wouldn’t be for me. I’m not a fan of the present tends. And an ending that’s not convincing would probably bother me a lot. Still, the setting and context are interesting. The ending was so annoying – it seemed to end but I knew it hadn’t because there were pages left in the book. What followed was a bit like reading a fairy story ending. I’ve just read this too and I also felt torn about it. I didn’t really have a problem with the pace, but I found the final few chapters too melodramatic and contrived. I don’t like the present tense either, although it seems that it’s being used more and more often these days. It seems quite a lot of readers don’t like the use of the present tense. I’ve tried to analyse why I don’t like it and find it quite puzzling, because in some books, such as Wolf Hall, I have no problem with it but in others such as Elly Griffith’s Ruth Galloway books I find it jars and irritates me. I’m going to comment on your review and mine now! You are right about the contrived ending and that certainly dented my overall enjoyment – as you say the wicked took a while to show their faces.